My daughter is now in seventh grade. When my son entered the same grade, he got a cell phone. So this weekend, we went to change carriers and get her a new phone. Oh my, what a practice in patience. I had forgotten how long it takes to transfer a line and start up a new phone. We were in the store for more than an hour. One hour of doing nothing but sitting and occasionally getting up to sign something. Now, I realize that this is a trivial manner – “first world problems” as my husband calls them. Yet, why is it not so much of a burden to wait an hour for a new phone but to wait upon an answer from God seems like the wait of the ages? True, He may take a bit longer than an hour to get back to us, but still. The point is that we will gladly wait that hour of our life to get what we want but when it comes to spiritual matters we expect them to be answered right away. Sometimes God says to wait. Sometimes we have a few more lessons to get under our belt before He answers our prayer. And sometimes, God just flat out says “no” and we don’t like that word, do we? We are not accustomed to being told “no”. But regardless of the answer He gives, He hears every prayer we utter. He listens to them all, even if He doesn’t answer right away. But when He does, He answers in a big way. Not only will He pull us out of our situation, if needed, but He will establish our way and set a new song on our lips. And here is the kicker – when He does all of this, it is our responsibility to give credit where it is due – to Him. We need to be diligent about praising His Name when we receive an answer to prayer. He is God, that makes Him higher than all other names. He doesn’t have to listen to me. He doesn’t have to pick me up when I fall. He doesn’t have to dust me off and set me on the right path and give me new song. But He does, because He loves me that much. And that, dear friend, deserves praise and honor and glory. So today, or this week, when you find yourself waiting, whether it be for something or someone, remember that God may be giving you this opportunity to practice patience for a reason – you might need it real soon. My son and I were at a stoplight yesterday when he said, “Mom, look! How cool is that?” So, of course, I had to get a picture. We are called to be a transformer. Isn’t that what Paul is telling us in this verse? If you know anything about Transformers, you know that they can change from a car to a robot at will. The old cartoon version had a song that said – “Transformers, more than meets the eye.” How appropriate is that for us today??!! We are supposed to be “more than meets the eye”. We have a Power within us that is beyond human comprehension. We have the Creator of the universe on our side. And that gives you the ability to transform. This transformation needs to happen on a daily basis. It should be the first thing you do in the morning. Now, I get that not everyone is a morning person. I have two of those at my house. BUT, just because your body won’t cooperate in the morning doesn’t mean that your mind can’t. In fact, this is where the real transformation occurs – in your heart and your mind. You have to invite Jesus to walk with you through your day. You have to invite Him to transform your thoughts and your actions. You have to allow Him to conform you to Him and not leave yourself open to the ways of the world. Did you notice where the cross was at in the picture above? It was on his forehead. For me, that means that I need to allow God access to my mind. My mind is a scary place sometimes. The thoughts that run through it are not always pretty. But when I get out of the way and let Jesus in, amazing things begin to happen. Instead of being frustrated that my kids are running late for school, I see the opportunity to chill for a moment. Instead of being burdened by planning yet another meal for the road, I see an opportunity to serve. God can change perspective. And perspective matters a lot. One more thing about the picture – it’s a helmet. In my crazy mind, it’s a helmet of salvation. The purpose is partly two-fold – protection and identification. The helmet protects your mind during battle. It keeps the devil from getting to your thoughts and attempting to control them. It also identifies you as God’s soldier. By wearing your helmet, everyone should know Who you belong to. And it only fits when He gives it to you. 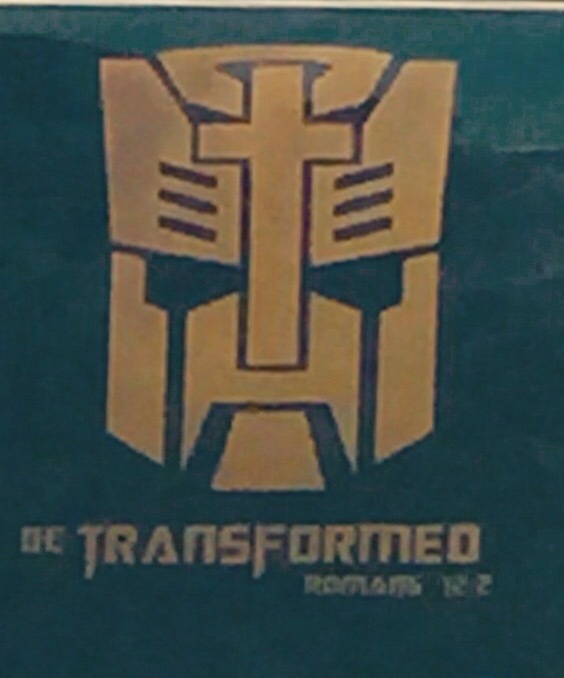 So, let me encourage you today to be a Transformer. Be more than meets the eye. Wear that helmet with confidence in the One who gave it to you. Allow Jesus to change you from the “everyday Joe” to someone spectacular! It has been a busy week. And it’s only Wednesday. Lord, help me. Last night on the way to ladies’ meeting, my gas level indicator went from a number to those dreaded dotted lines. You know what that means? You had better get to the gas station because this baby is about to sputter to a stop. Well, I had to wait until after the meeting and several miles because the church building is no where near a gas station. But God brought me through it and I didn’t end up on the side of the road between here and there. As I was driving along watching those dotted lines blink, I thought about my spiritual gas tank. Am I blinking there too? Here is the problem I perceive – I see too many people filling up their tank once a week and thinking that will get them through their struggles for seven more days. I don’t know about you, but I run around so much in my car that I have to fill up at least twice a week. If I am physically moving about so much that my vehicle cannot make it on one tank of gas, how can I think that I can make it on one tank of spiritual gas and survive all the firey darts of the devil? This world is tough. We face so many challenges each and every day. And we face them whether we are running around chasing kids or sitting at home as a shut-in. There are challenges and problems every where. I know I need a refill as often as possible. Jesus doesn’t want us to run around life with our light blinking. He doesn’t want us to live on the edge, waiting to see if we can make it until Sunday. When Paul wrote these verses to the Ephesians, it was his desire (and God’s through the inspiration of the Holy Spirit) for the people to be filled up on a daily basis and even more so when they met together as a local New Testament church. When we spend time in God’s word and around God’s people, we begin to understand a bit more about His love, His understanding and His forgiveness. We begin to see a bit more of His fullness in our life. But that can’t happen if we don’t get into His word and meet more often with His people. It is Wednesday. Tonight is prayer night at many churches, including mine. Wednesday night services are very intimate and special at our church. It is a time for fellowship and renewal. It is a time for learning and sharing. It is an opportunity to fill up your spiritual tank. So let me encourage you to fill up that tank today and tonight. Jesus wants to help you make this the most amazing life possible. He wants to fill up your cup until it is running over. But He can’t do that if you have your hand over the top of the cup. You have to remove your hand and move the cup over to where He is at. But the choice is yours to make. Are you going to face the rest of the week on a partially empty tank or are you going to fill it up? The choice, dear friend, is yours. Yesterday was a good day. My daughter accepted Jesus as her Savior August 12. Yesterday, she was baptized. You see, we had thought that she was saved. But she came to me on the night of the 12th and said to me that she didn’t think she was saved. She said that she thought that when she was little, that she just said the prayer and did what she needed to do just because she wanted to make her dad and I proud of her. But on this night, she understood that she had said that prayer for the wrong reasons and that because of that, she wasn’t saved. I asked her if she wanted to take care of that right then and there. She responded, “yes”. So, that night as we sat on the couch in the front room, my sweet little girl confessed her sin, asked for forgiveness and asked Jesus to come and live in her heart as her Savior to lead her and guide her the rest of her days. She confessed that she believed Him to be her one and only Savior and Redeemer. It was beautiful. On the way to church yesterday, her favorite song came on the radio, well, one of her favorites, and she began to sing. We love to listen to contemporary Christian music while in the car, especially on the way to church and school. It helps us to get our focus where it needs to be. The song she was singing was “How He loves” by the David Crowder Band. And when she sang this song in the car yesterday, it almost brought me to tears – she was singing a “new song”. It was the first time she had sang it since her new birthday. She had a whole new perspective on His love and forgiveness and understanding. Jesus doesn’t care who you are, how old you are, what you have done in the past or anything like that – He is concerned about the future. He wants you to spend it with Him. And yes, you have made mistakes. You may have asked Him into your heart a long time ago, but did you mean it? Did you do it just to please others or did you do it because you truly believed? It’s okay if this is you. The MOST important thing is that you get it right, right now! Don’t wait another second. Don’t be ashamed. Don’t be embarrassed. Jesus never gave up on my daughter. I had no clue that she was thinking about this. I had no clue that her salvation was not secure. But Jesus knew the state of her heart and He never stopped pursuing her. He never stopped pricking her heart. And for that I am so grateful. Do you have a new song? Are you singing in your heart the praises of His name? Let me encourage you today to have a heart check. Make sure that your salvation is secure in Him. Life is too short to wait and eternity is too long to toy with. Get it right today. What is a problem? I could not find the specific word “problem” in the Bible. They used different terminology than we use today. But from this verse you can get the gist of what problems were in Paul’s time. Paul experienced problems. He had some sort of “thorn in the flesh” that God would not allow to be taken from him. Some think it could have been blindness. I guess we may find out when we get to Heaven. But until then, let’s just look at problems in general. A problem can be defined as “In general, any question involving doubt or uncertainty, and requiring some operation, experiment or further evidence for its solution.” (Webster’s 1828 Dictionary) Paul had a problem that he had to choose how he was going to respond it. He could whine and complain about it or he could choose to give God glory in and through it. He chose the later. And the reason is because God reminded him that when he (Paul) is weak, He (Jesus) is strong. God can use our weaknesses to show His strength. Problems are something that we encounter every day. Some may be long term problems and some may be spur of the moment problems. Either way, we have to choose how we are going to respond to them. Sometimes our spur of the moment problems become chronic. Why? Sometimes it is because we choose not respond to them properly the first time. They keep coming back. And we keep responding to them incorrectly. And that’s when a transformation happens – they become burdens. A burden is defined as “That which is borne with labor or difficulty; that which is grievous, wearisome or oppressive.” (Webster’s 1828 Dictionary). When we choose not to give it over to Jesus to handle, when we think that we can handle this problem on our own, it becomes grievous and wearisome and oppressive. I am the first one in line for this issue. Problems are my specialty. For example, give me a knot in a rope or chain or something that is supposed to be straight and I can figure out a way to straighten it. I am a professional knot-getter-outer. Yep, that’s a word in my world. Sometimes I think I can do the same thing with problems. I think I can handle them all on my own. I’ll show them. I can do this. And then not too long afterwards, I find myself on my knees because the burden is too much, my heart is too heavy and my spirit is too weak. And that is when I turn around and see Jesus right there waiting to hear from me. That’s when He is standing there with arms open wide, ready to receive me right where I left Him. So let me encourage you today to make the right choice with your problems. Don’t let them become burdens. See them as problems and let Jesus help you solve them. Don’t try to go at it alone – that’s when the potential for a burden sets in. Jesus is ready and willing to walk with you through whatever comes across your path. Alone time. We all need it, don’t we? With my kids having gone back to school, I now have some time to myself. It is beautiful. But I have a problem, I find myself constantly working at home. You know, cleaning, picking up, doing laundry – all the mom stuff that we complain about. My husband reminded me the other day that since the kids are back in school, I need to find some time to chill. He said, “I don’t care if it is just stopping long enough to drink an extra cup of coffee. Do something to relax every once in a while.” He knows I need it. I know I need. So, who’s going to tell my crazy brain that I need it?! I can come up with a million excuses of why I shouldn’t sit on the couch and read a book. Alone time is good though. You need that time to just be. Jesus recognized that in the midst of His busy life that He needed some time away from his beloved disciples. They were just like His children – yes, I know they were God’s children but sometimes they acted like toddlers! Sometimes we all act like toddlers and the ones that we are around need a break. Just try to imagine Jesus’s time alone – if He was anything like me, He was talking to Himself while He was straightening it all out in His mind. He may have found a nice tree to lay underneath and take a little nap, that was very much needed. He may have found a nice fruit tree and had a little snack. He may have just enjoyed some of the memories of recent and past times that were a comfort to Him. Whatever He did, the disciples weren’t too worried about Him. They just started off for the other side of the lake. I find that interesting. How could they have just left Jesus behind like that? I would have been really concerned about where He was. Maybe that’s just the times we live in – we have to know where every one is at all the time for fear of someone taking them and/or hurting them. The disciples knew that Jesus would show up eventually. They didn’t seem too worried about it. They trusted Him, at least they trusted in the fact that He would eventually show up. So, the whole point in all of this rambling today is this – take some time for yourself. Plan it in your day at least once a week. Maybe it’s just sitting at the coffee shop alone with your latte. Or maybe it’s just sitting in your bed with a book 15 min before the spouse comes to bed. Or maybe it’s just folding laundry without all your “helpers”. Whatever your moments of solitude look like, enjoy them. Pray during them. Remember who you are during them. It’s a time to rejuvenate and recharge. If Jesus needed that time alone, then surely you need it as well. Sometimes we pop off at the mouth. We let our words escape our mouth and they are out there before we think. And therein lies the problem, thinking before we speak. What we fail to consider sometimes is that once those words leave our mouth, there is no getting them back. They are out there for the world to consider, remember and use against us at will. Words are very powerful things. They can encourage. They can tear down. They can create joy and sadness. They can make life worth living and they can destroy dreams. But the most important thing to think about when considering words is the mind behind them. You see, what is in your heart eventually comes out of your mouth. And because of that, every word you speak will be held accountable. Wow. How many times do we tear someone down behind their back thinking that they will never know? Guess what? They will. They will be standing at the Judgment just like us. I know I would do better to remember this fact more often than not. The brain is an amazing organ. No one truly understands how it works or why. But God does. He created it. He knows what is in there and subsequently, He knows what is in our heart. He knows the evil we think and the evil we do. He sees the sin that we have in our heart and knows that eventually it will make its way out of our mouth. But you know the beauty of it all? He knows our sin. He knows our thoughts. And He is ready to forgive us of all of it. Now, He wants a part in preventing problems as well. He wants us to allow Him to get in there and wash it all clean and create a new and better place to think and consider. And it is possible. But it needs to be done on a daily basis. We have to give Him that job consistently and constantly. And when we do, we are so much better prepared not only for the day but for life. But as far as “let your words be few”, I’m not so sure that is in my DNA. I come from a long line of gabbers. And that’s okay. You see, I know that God uses my gift of gab to bless others, at least I hope I’m a blessing. The thing is, I have to allow Him to direct my gabbing. If I go at it on my own, that is when I end up with my foot in my mouth – and that is never pretty. So let me encourage you today to allow God to direct your words and the thoughts behind them. And if you have the gift of gab like I do, embrace it and let God use it. If not, try going out of your comfort zone and gabbing for a change. It is actually quite fun!